The Red Sea resort of Sharm El-Sheikh in Egypt used to be popular with Russian visitors; now it's nearly empty. The number of Russians traveling abroad for their vacation has fallen by almost one third in 2015, the biggest drop in 15 years. Russian tourists made just under 10 million trips to foreign countries in the first nine months of the year, down from more than 14.5 million in the same period in 2014, according to data from the Russian tourism industry association RATA. Here's why: First, terror attacks and political tension have reduced the number of countries where Russian tourists feel welcome. Second, places that are still safe and attractive are becoming too expensive following a collapse in the value of the ruble. The numbers are likely to get even worse, as the data for January to September doesn't reflect two huge blows Russian tourism suffered in the last month. Russia's foreign ministry suspended flights to Egypt and recommended its citizens stay away from the country after terrorists blew up a Russian plane shorty after take-off from the Red Sea resort of Sharm El-Sheikh. And just last week, a diplomatic spat between Russia and Turkey ended with the Kremlin barring Russian travel agencies from selling trips to Turkey, and banning charter flights to and from the country. That puts two of the most popular destinations off limits for most Russian tourists. Turkey has been top of the list for Russian tourists for 13 consecutive years, attracting 2.5 million in the first nine months of this year. And some 1.5 million Russians visited Egypt in the same period. The Russian government's ban on trips to Turkey came after its air force shot down a Russian warplane near the border with Syria last month. Russia's economic crisis is forcing many more tourists to take their vacations at home. The slump in the ruble is one problem, falling disposable incomes another as inflation soars. 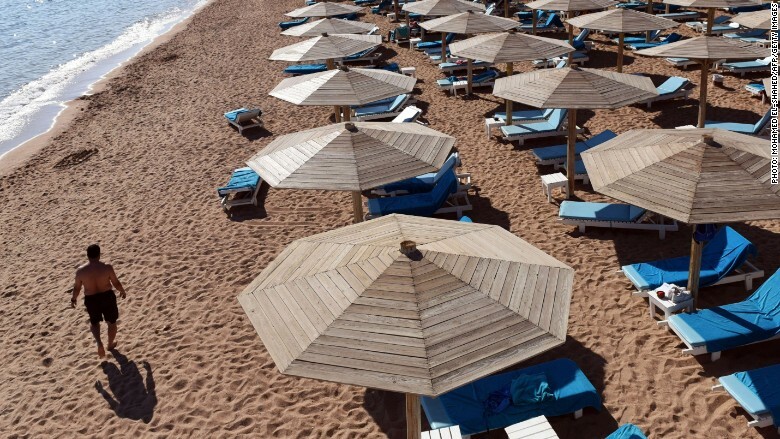 Long-haul destinations saw the biggest drop in visits, with the number of trips to the Dominican Republic dropping by 88%, and to Tunisia by 83%, RATA said. India, China and Thailand all experienced falls of more than 50%. The number of trips Russians made to Europe declined by 34% overall, with Greece, Spain, and Croatia suffering the worst losses. Relations between the European Union and Russia are at their lowest ebb since the Cold War. Europe imposed sanctions on Russia in 2014 over its intervention in Ukraine. President Vladimir Putin has urged Russians to holiday at home, and ordered his government to find ways to support the domestic tourism industry.